Congratulations to our Sea-Doo Picture the Week winner Weston Yeager! 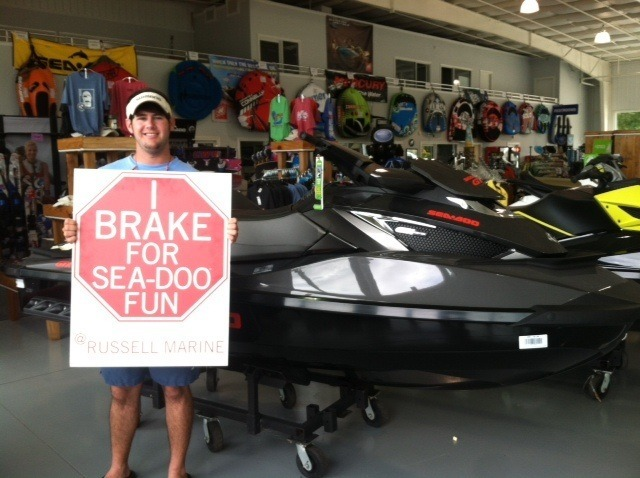 Weston visited Russell Marine in Alabama and captured this picture by his favorite Sea-Doo and then submitted it to our “I Brake For…” Sweepstakes. Weston entered the Sea-Doo “I Brake For…” Sweepstakes and his image was chosen as one of our featured images of the week. His image received the most votes in the weekly contest! He won a Sea-Doo XPS Maintenance and Oil Change Kit that keeps Sea-Doo watercraft running in top condition. Congratulations Weston! Thanks for sharing your Sea-Doo lifestyle with us!